Automatic Gravity Filling machine is very economical machine and used for limited range of applications. Ideal for thin, low viscosity, free flowing liquids of any type, including high foaming products. 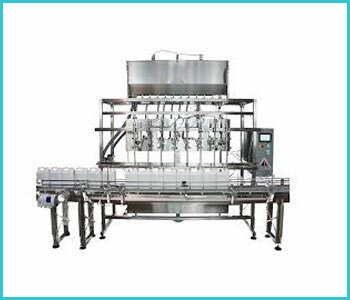 Gravity Filling Machine is best suited for liquids with very low viscosities that do not vary with ambient temperature or with batch variation. It is most suitable for applications where recirculation of the liquid in the fluid path is not desirable. This is especially true for corrosive chemical filling like acids and bleach. Although gravity filler is used mainly on products that do not foam, foam may be limited and controlled by subsurface or bottom-up-fill capability. Entry and exit bottle gating cylinders adjustable, sideways, up & down and inside & outside. Can also fill Plastic and glass containers. Included Air Filter Regulator and Safety Lockout Valve. Air filter regulator, safety lockout valve and valve activated by float on tank are mounted on the pump. Bottle management and filling sequence is automatically controlled by the filling machine.